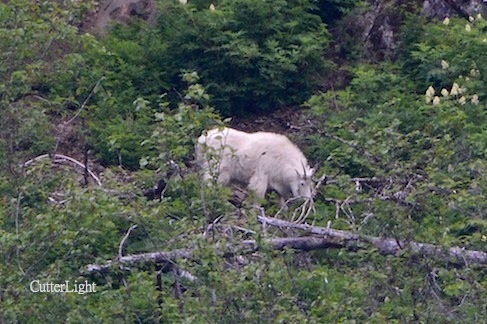 The drive from Anchorage to Seward can usually be counted on for wildlife viewing. Grizzly bears, black bears, Dall sheep and moose are all possiblities, and eagles are a given. On our first trip of 2013, we found a young moose grazing on pond weeds and willow buds. Last year at this time we were shooting with a Nikon D60 and a D90. Our three most frequently used lenses were a Tamaron landscape lens, a Nikon 60 mm prime and a Sigma 50-500. We got some really good photos with this gear, but we were eager to make some upgrades. Although it’s late May, Alaska’s Kenai Peninsula is still pretty brown and you don’t have to go very high in elevation to find everything covered in snow. But spring is definitely here. Today (May 24), temperatures in Seward broke 60 under cloudless blue skies. After months of reading and research and lengthy discussions with a new friend who knows way more about this than we do, we purchased a D800, a D4 and several new lenses. Equally important was taking Joel Sartore’s 24-lecture course Fundamentals of Photography, a first-rate DVD course offered through The Great Courses. We had been reading all kinds of articles and books and we subscribe to Outdoor Photographer. We had also taken a few courses at Ritz Camera back when we were living in Sacramento, California. All of this was useful. But none if it provided the learning experience Fundamentals of Photography gave us. Armed with our new gear and committed to faithfully following Joel’s lessons, we could see our skills improving from week to week. Our usual MO while driving Alaska’s highways and hiking the trails is to have either a landscape lens or a normal lens on one camera body and a larger wildlife lens on the other. We still talk about the time when, new to this part of the world, we saw two magnificent bull moose feeding near each other at a small lake. “I’m sure we’ll see lots of these now that we’re up here,” one of us said as the other kept driving. Needless to say, we’re still looking for another shot like that one. Lesson learned. 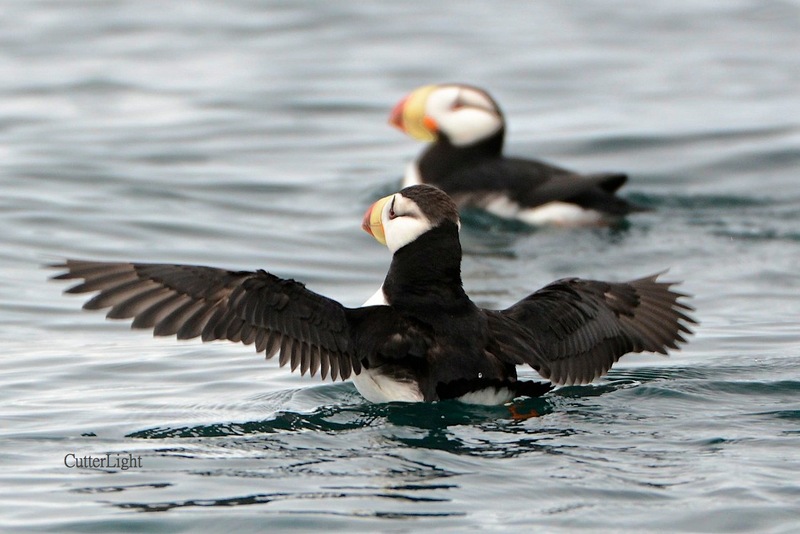 Hopefully this summer will be another Alaskan safari – packed with birds, fish, mammals, wildflowers and the kind of scenery that causes one’s jaw to drop and hang. 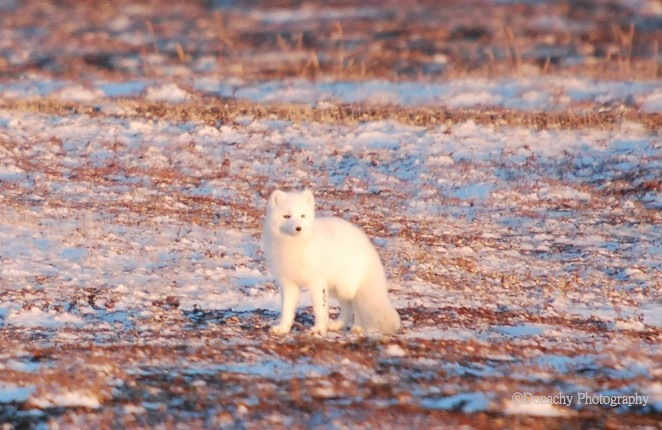 Stunning in their soft, white coats, Arctic foxes (Vulpes lagopus) are common in this part of Alaska. 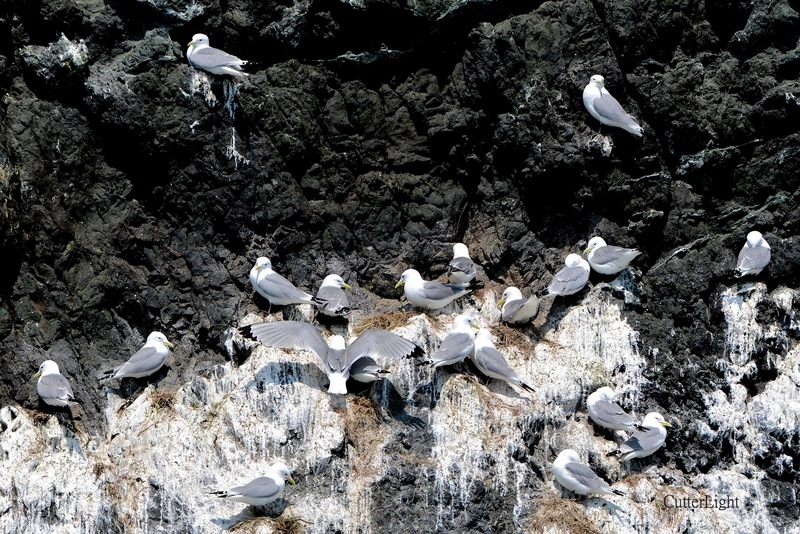 The size of a small dog and as soft on their feet as a cat, these omnivores forage on whatever is available, from berries to insects to small mammals and birds – and it appears, big, fat marine worms! In the past few weeks, there have been spawning events on our beaches near Point Hope. 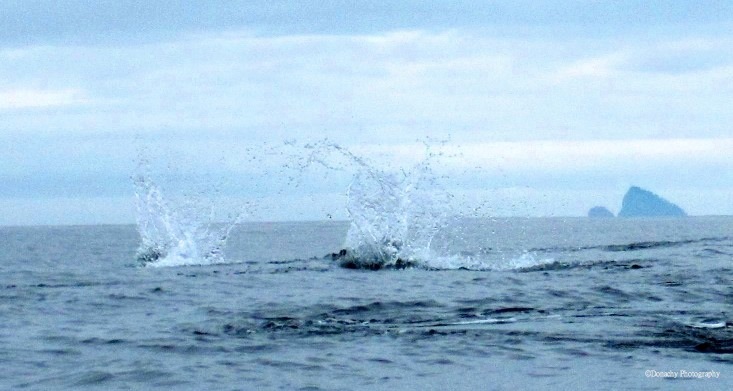 A couple of weeks ago, we were hearing about small fish – probably capelin (smelt) – coming ashore with the surf. More recently, we’ve been finding large marine worms on the beach. The size of Ball Park Franks, the appearance of these worms has coincided with egg cases in areas of coarse sand and gravel. In turn, these spawning events have drawn numbers of snowy owls and Arctic foxes looking for easy meals to the point of land west of town. 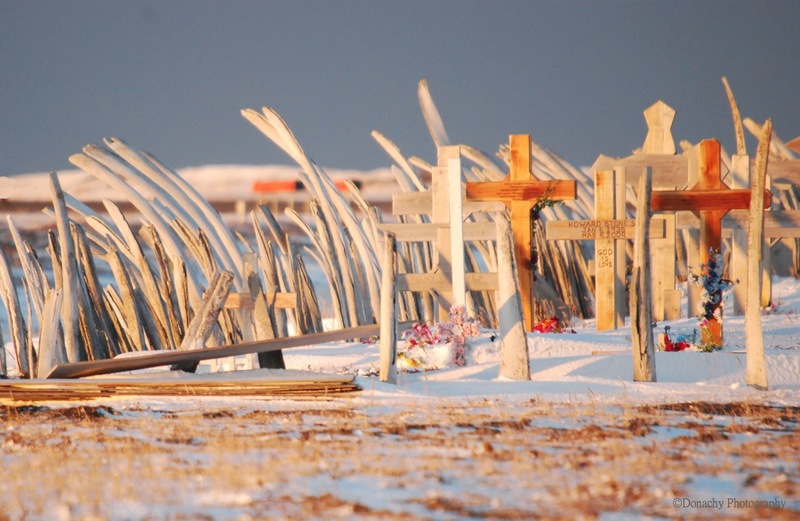 Morning sunlight slants through the jawbones of bowhead whales commingled with crosses at the Tikigaq cemetery in Point Hope, Alaska. Not so long ago, National Geographic Magazine ran an article about domesticating foxes. Apparently there’s been some success, as breeders in Russia select the most gentle, friendly, trainable and inquisitive offspring generation upon generation. At an average size of six to eight pounds, Arctic foxes would be just the right size to curl up on the sofa for an evening of popcorn and a movie. 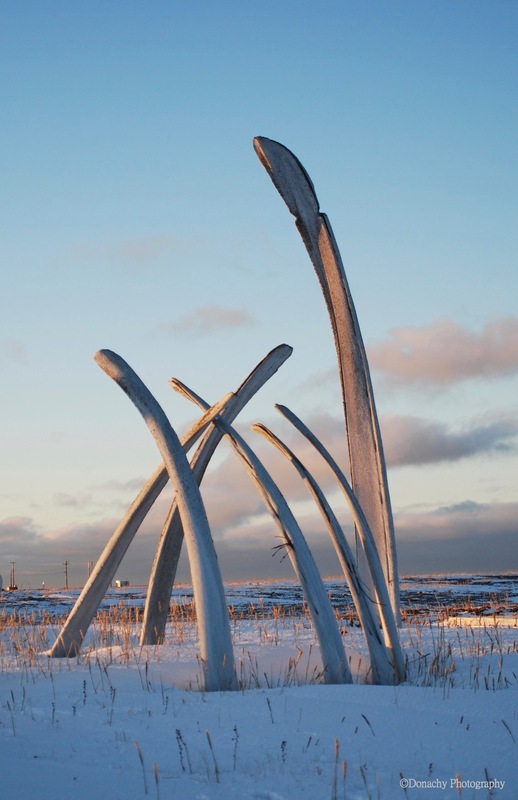 Like ribs pushing up from the tundra, these bowhead jawbones mark the resting place of one of Tikigaq’s last shamans. The diversity – and sheer number – of animals and plants that manage to hack a living out of this cold land amazes us. 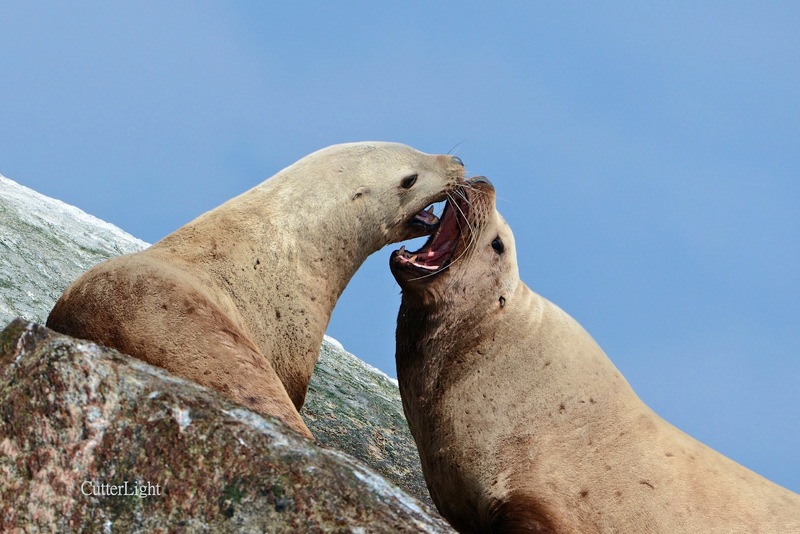 Far from being the vast, frozen desert the Arctic has often been described as, each season brings with it an astounding number and variety of flora and fauna to the land and sea around Point Hope. Tracks in the snow near our house reveal that we have a weasel or two living beneath our porch! Silvers and Pinks (And Otters)! 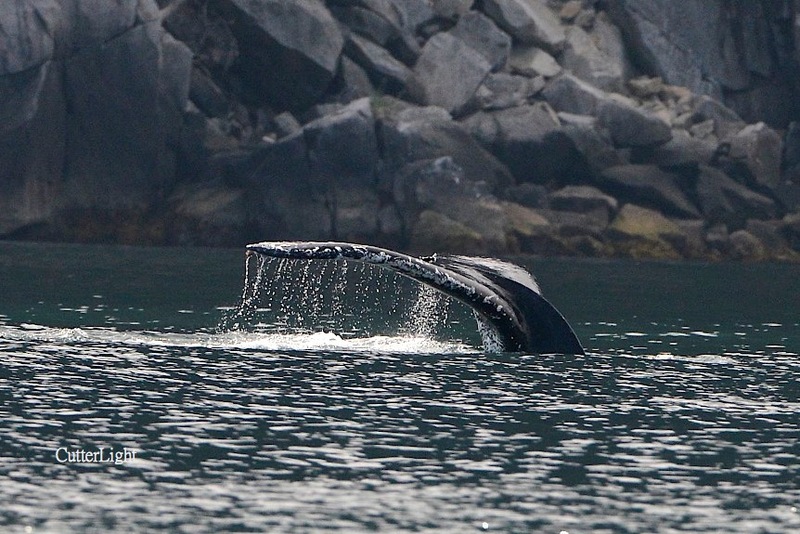 This curious fellow swam right up to our C-Dory, Gillie, to watch me rinse off a salmon Barbra had just caught. Alaska. Every trip out on the water is a reminder that you could live here several lifetimes and never see it all. 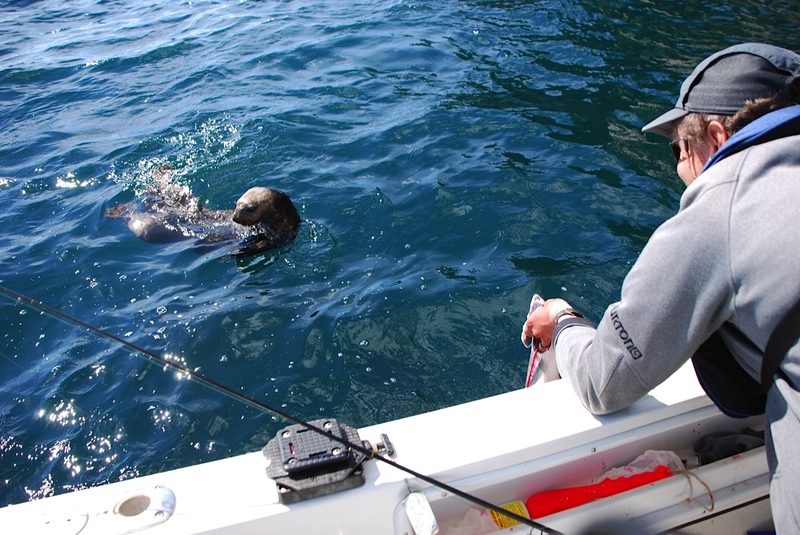 While sea otters are fairly common along the southern and central Alaskan coastline, we’ve never have one swim up to the boat. 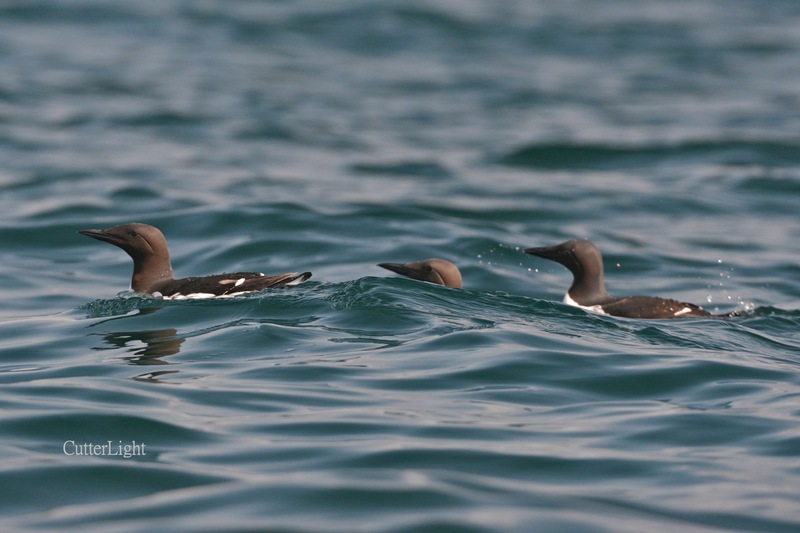 (Although, there were a trio that used to follow us as we walked the docks in Cordova.) This guy seemed genuinely curious – and maybe hopeful of a handout – as I rinsed off a Coho before putting it in the fish box on a recent excursion to Rugged Island in Resurrection Bay, near Seward. Meanwhile, floating on her back with a pup on her stomach, a mother otter watched us a little more guardedly and from a distance. 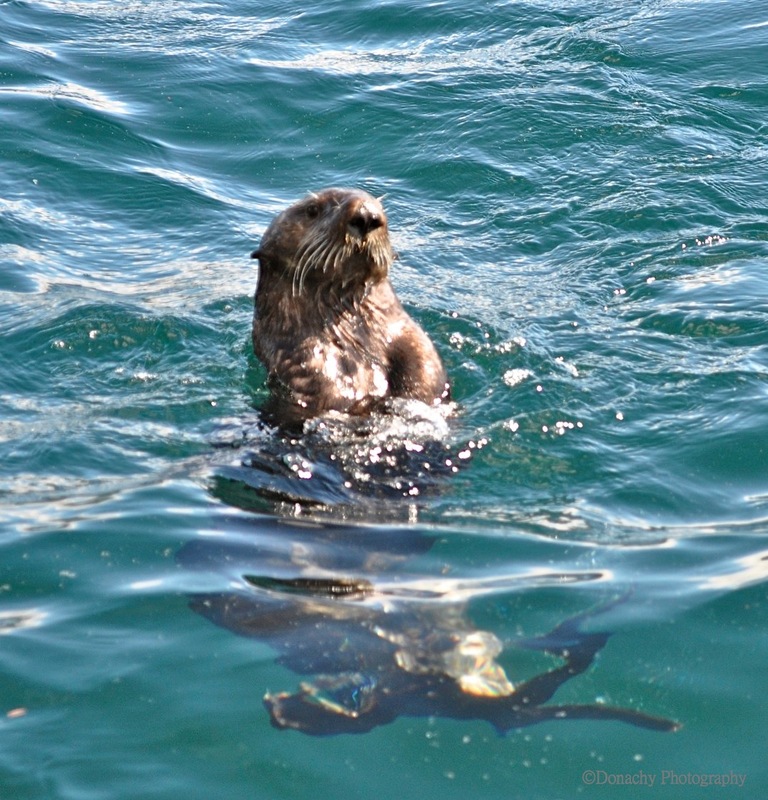 Fishing partner Bixler McClure got this shot of the otter coming over to investigate the boat. 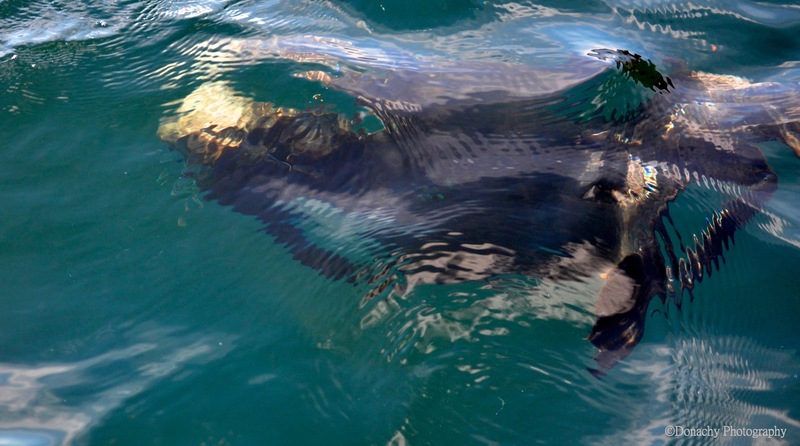 On any given sailing or boating trip out on the bay, you’re likely to encounter harbor porpoises, Dall porpoises, Orcas, whales, eagles, thousands of sea birds, leaping salmon, seals, sea lions and every once in a while you might spot the fin of a seven-foot salmon shark (they look very much like small great white sharks) cutting through the water. Bears come down to the beaches, and on rare occasions a wolverine might be glimpsed. And, of course, there are the fish. Resurrection Bay lies between green-shouldered, snow-capped mountains – a dramatic backdrop. 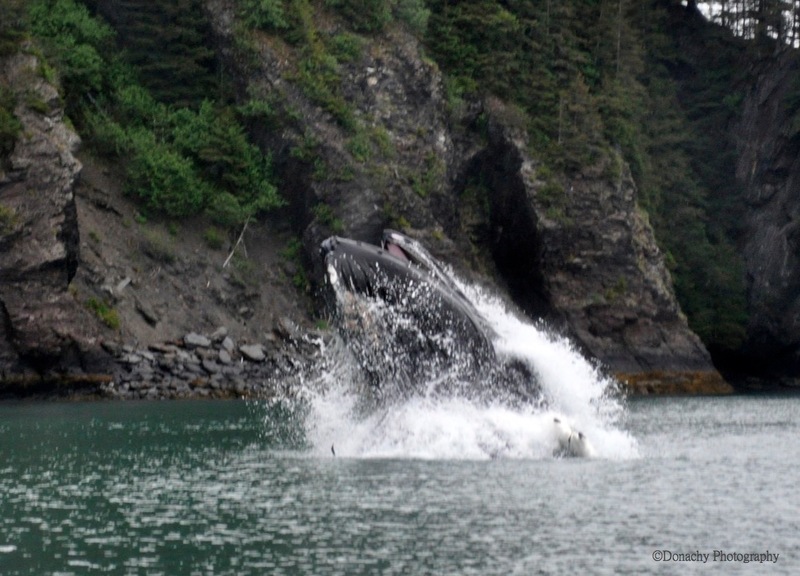 It extends over 10 miles before meeting the Alaska Gulf, and on many days the waters are nearly glass smooth, rippled only by a gentle breeze. On days such as these, the fishing is truly pleasant. 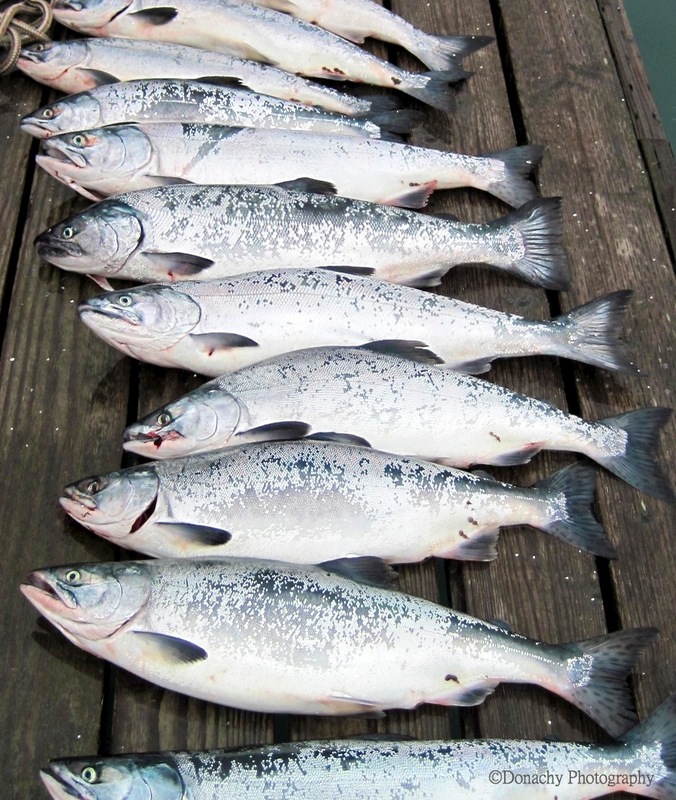 When the silvers (Coho salmon) show up – usually the run is in full swing by mid-July – the fishing is excellent, with six-salmon limits the norm. 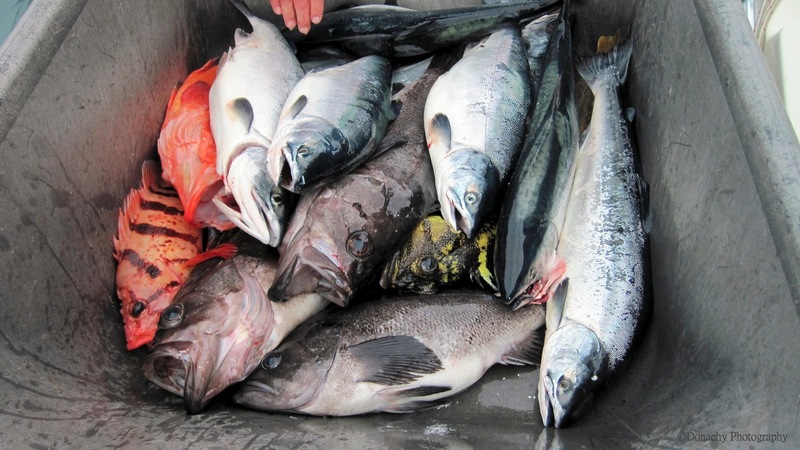 Skilled (or lucky) anglers often mix in a king or two, and after you’ve got salmon in the fish box you can switch tactics and target rockfish and halibut. There are bigger rockfish and halibut out in the Gulf – and more of them -, but if you stay with it you can find fish in the bay and you don’t have to deal with a long run. The custom here is to take the fish out of your fish box and load them into a dock cart so you can wheel them up to one of the fish cleaning stations. Once we’ve filleted our fish, we take them to J-Dock to be vacuum packed and flash frozen. Fish cared for this way taste great even a year or more later. Below: Barbra got this watery photo of the otter swimming around Gillie. Below: Three limits of salmon and a couple of rockfish, laid out, rinsed off and ready to take up to the cleaning station. 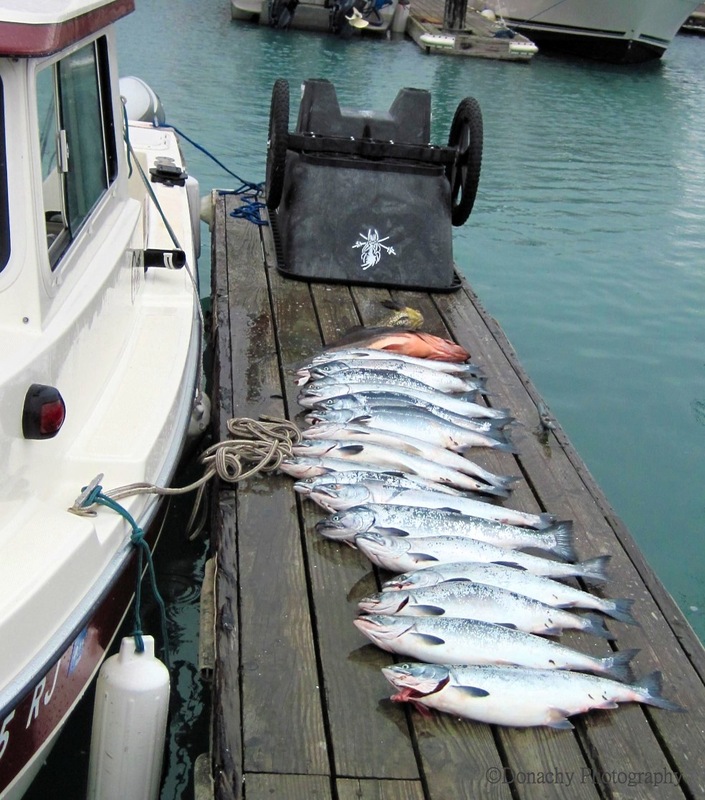 This winter in Point Hope, every meal these fish provide will be a memory of our summer in Seward. These are the good old days. 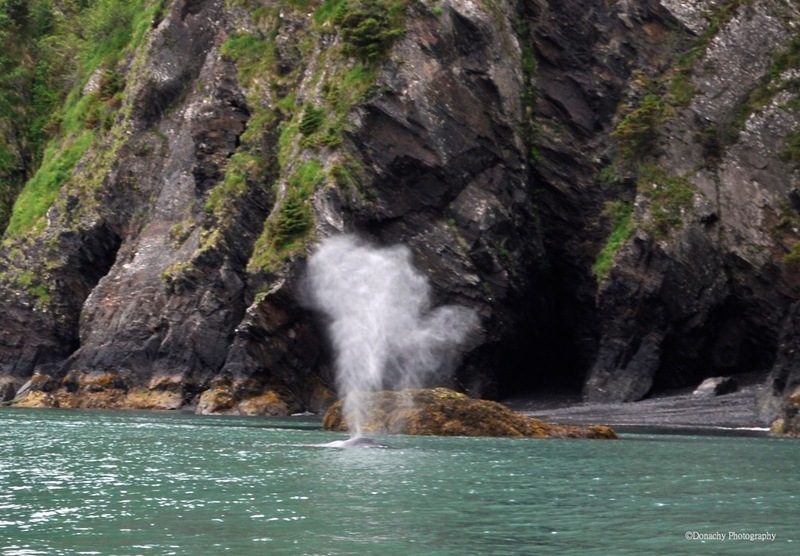 Quintessential Alaska – a whale blows close to moss and fern covered rocks in Resurrection Bay. The water is hundreds of feet deep near shore here – this slope face rises almost vertically to snow-coverd peaks. 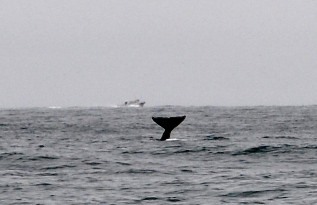 Coming back from a fishing excursion the other morning, we spotted a pair of whales near shore, off our forward port (left) quarter. 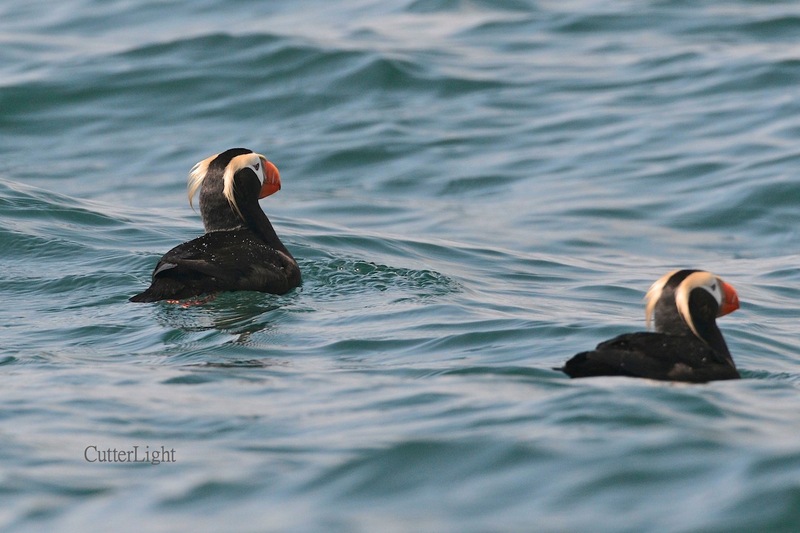 They appeared to be in no hurry and so we, too, slowed down to spend some time watching them. 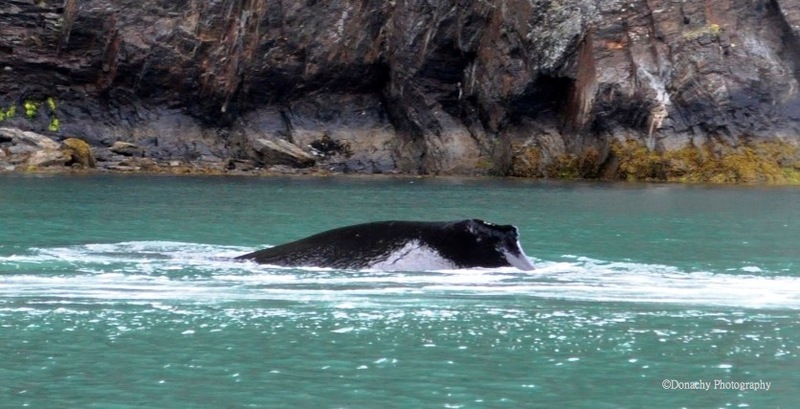 Here and there we noticed telltale herring flipping on the surface – no doubt the reason the whales were in so close to shore. The steep banks would make the perfect place to corral a meal. 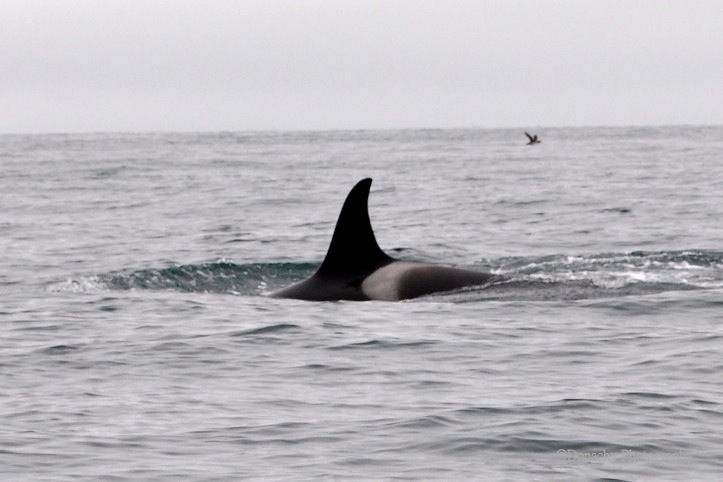 Smooth back, pronounce fin and white markings on the side indicate a minke whale – a member of the rorqual whale group. 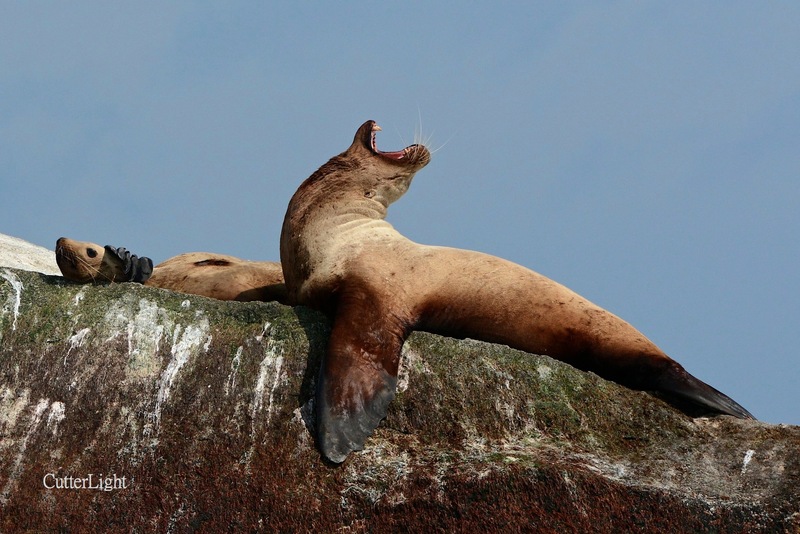 Rorquals feed by opening their massive, expandable mouths and straining small fish, shrimp, krill and other food through baleen. 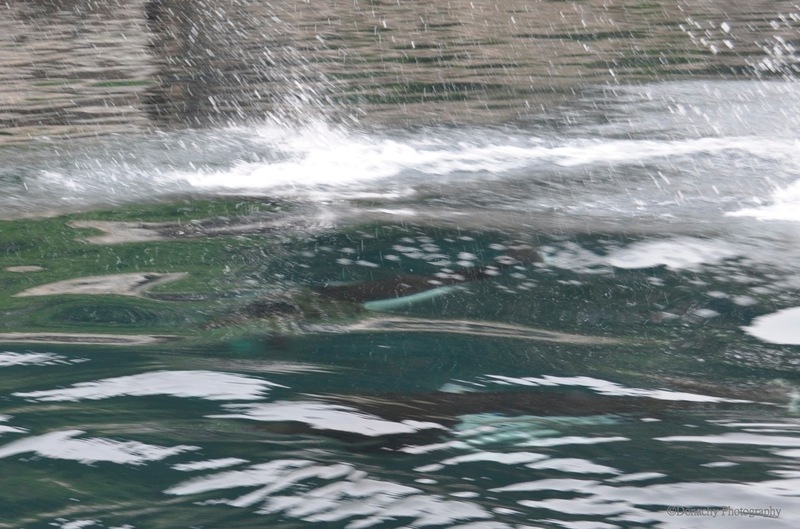 This photo (taken with a Nikon DX 18-55 lens) captures the blowhole and the distinctive white markings of a minke. We lingered, hoping to capture a repeat feeding lunge on film. And then it happened. 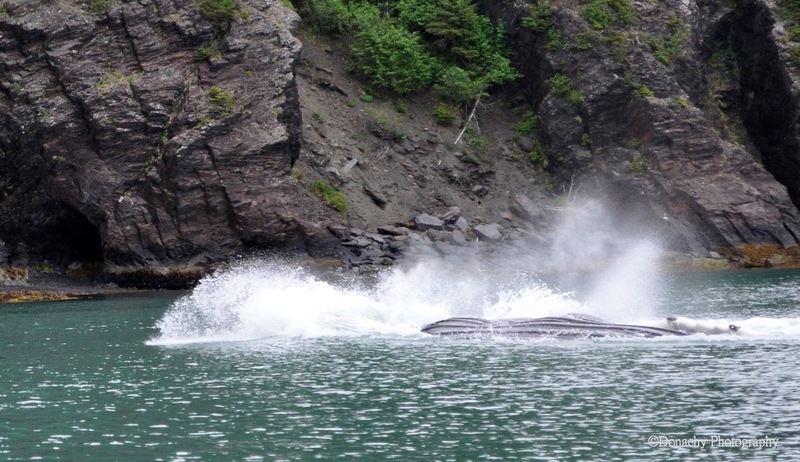 If you look closely, you can see a couple of herring in the spray around this minke whale’s head. Suddenly the surface of the water began to bubble with jumping herring, and then, as if out of nowhere, a huge head came exploding out of the sea. Fortunately Barbra had the presence of mind to snap photos. 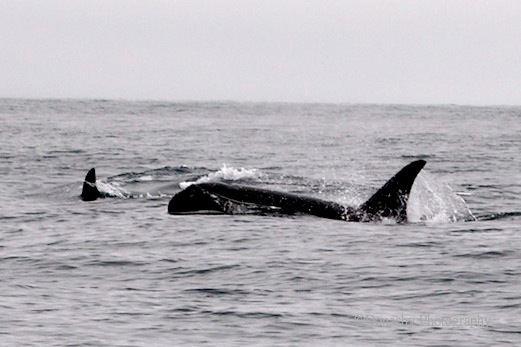 By the early 1900’s, after the world’s whaling fleets had mined most of the large whales out of the ocean, countries such as Norway and Japan, which continued whaling, turned their attention to smaller whales such as minkes. They’re still being hunted, but they remain locally common, and overall populations appear to be stable. 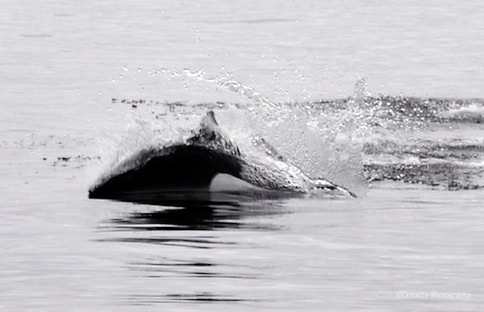 Minkes can be found throughout the world’s oceans. 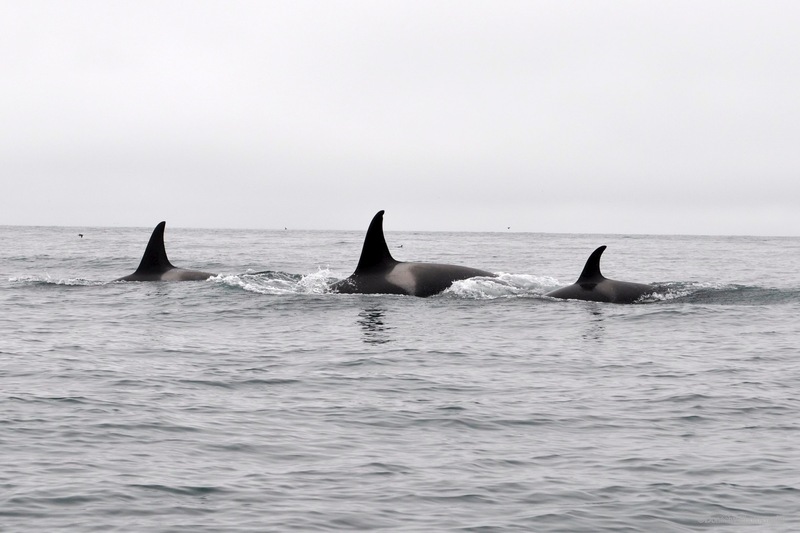 An excellent field guide to Northern Pacific whales is Whales and Other Marine Mammals of British Columbia and Alaska, by Tamara Eder.